ERP Implementation Manifesto | ERP the Right Way! An ERP implementation is the implementation of a business solution. A business solution is composed of people, business processes, and technology. People are the most important component of a business solution. The implementation of a business solution requires multiple methodologies to be employed (project management, software development, organizational change management, business process management, quality management). One methodology cannot effectively cover all the required disciplines. Technology alone does not mature a business model. Decisions – not documents – move implementations forward. Our key objective is to assure customer success through early and continuous delivery of value-add business solutions. Welcome differentiated business requirements, even late in the implementation cycle. Rapid, iterative processes take advantage of change for the customer’s competitive advantage. Competitive advantage only comes from revenue-generating business processes. Customers must adapt their expectations of how software supports business to effectively leverage ERP. Proactively eliminate non-value-add business requirements from the requirements management process. Maximizing delivered “Out-Of-The-Box” ERP functionality is key to Return On Investment. ERP makes for an expensive custom solution. Knowledge transfer is the greatest value an implementation partner can provide to a customer. A knowledge transfer process should be formally defined and measured. Implementation partners should enable customers to lead during the implementation by employing a progressive leadership style. The only viable solution is a managable solution. Better to learn DURING the implementation rather than AFTER the implementation. Can I translate this manifesto to Spanish and publish it in my blog and share it with the community? Absolutely! It would be great if you could reference my blog and my book. Maybe we can work together on future translations as I’m looking to drive global adoption. Contact me through angel.agueda@evergreenpm for future collaborations. Brett – I want to reference your book – what is the title and publisher. Thanks. Hi Wanda – please go to my blog: gbeaubouef.wordpress.com and look under the “Book” menu. This will provide you a link to my publisher and the ISBN #. Special request: If you could navigate through my blog and let me know how you like the experience then I would appreciate it. I’m always looking at making it better. Hi Brett, great work. I love how you’ve adapted the principles of the agile manifesto into your own ERP implementation principles. I wrestle with similar challenges when implementing CRM solutions for my clients. Especially, the value of sticking to the ‘out-of-the-box’ funcitonality. My opinion is that customers should stick to the standard features where it makes no difference to their competitive advantage. Where they manage a paticular business process in such a way that it gives them great advantage, then they should customise the system as much as needed in this area to support their competitive process. Make the customisation investment where it will lead to the greatest returns. Don’t just try and avoid all customisation otherwise any competitor can catch up with you by spending as little as you. Pingback: ERP is Only Part of a Business Solution « ERP the Right Way! 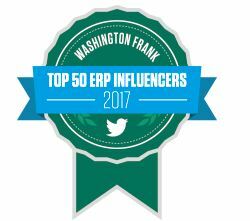 Pingback: Progressive Leadership for ERP « ERP the Right Way! Pingback: Accelerating ERP/COTS Implementations « ERP the Right Way! Pingback: Business Leads and Technology Supports « ERP the Right Way! Pingback: Decisions – Not Documents – Move ERP Implementations Forward « ERP the Right Way! Pingback: Best approach for gathering ERP requirements « ERP the Right Way! Pingback: Defining Product Scope for ERP Implementations « ERP the Right Way! Pingback: Creating a Flexible and Adaptable ERP Solution « ERP the Right Way! thankyou for contributing and sharing your well thought article. I like th econtent and relevance. If any of your listeners sould like to see what you shared I want to share with you also. Thanks again. Good to hear from you..
Pingback: Best of Breed vs. Integrated ERP « ERP the Right Way! Pingback: ERP Application Strategy Roadmap for Maximizing Long-Term ROI « ERP the Right Way! Pingback: Viable – Manageable ERP « ERP the Right Way! Pingback: Developing a Business Case for ERP Customizations « ERP the Right Way! Pingback: IT Should Move Up the ERP Value Chain « ERP the Right Way! I would suggest 3 additional componets to define a viable business process: quality data to fuel, compliance assurance and capacity to support and advance. Great points in the article. Thank you John for sharing your knowledge and expertise. I appreciate it! thanks for sharing your word .good work. Pingback: Cloud ERP Strategy: Goodbye IaaS, Hello IaaS « ERP the Right Way! Pingback: ERP Requirements Mgmt 101: What + Why = How | ERP the Right Way! Pingback: BPR, BPM, and ERP | ERP the Right Way! Pingback: ERP Implementation 101 – Deployment vs Requirements Gathering | ERP the Right Way! Pingback: ERP SaaS 101 – Services Trump Software | ERP the Right Way! Pingback: Troubleshooting ERP Projects | ERP the Right Way! Pingback: ERP Project 101: Challenging ERP Requirements | ERP the Right Way! Pingback: JIT is Just Plain Wrong for Cloud ERP | ERP the Right Way! Pingback: 365 Quotes for ERP Implementations | ERP the Right Way!